Lines are incredible here in Honduras….an excellent example is today when we went to TransExpress (the courier company we use to get things from the states). -Get in line at counter #2, show your card, wait for them to dig around in the back for your package, get a piece of paper from the guy behind the counter. -Take your paper and get in line at counter #1, wait for the cashier to type a billion things into the computer and then pay for the shipping and customs charges for your package, get a receipt from the cashier. -Take your receipt and get back in line at counter #2, show the guy your receipt and wait again while he digs around in back for your package. We are pretty used to waiting awhile for things around here, but three different lines for one package?! To top it off, today we got to do this twice….our first round through the lines we got to the end of our counter #1 wait and found out that the “system” was down (this happens quite often here) and they were only accepting cash. After walking all the way home, getting cash, and walking all the way back, Alex got to wait in the lines again only to find out that the “system” was back up and working and he could use a debit card! 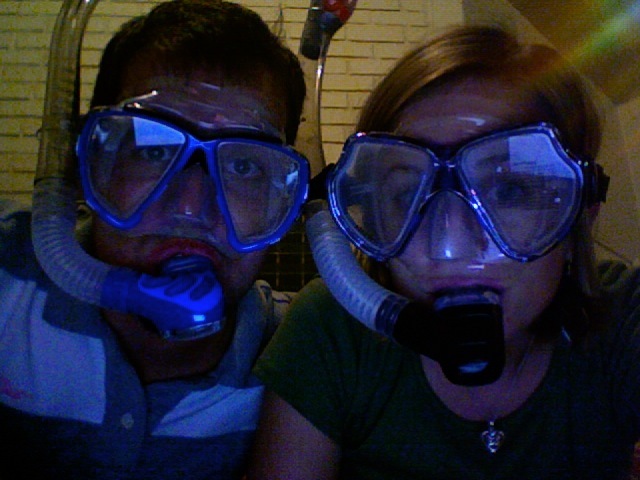 The happy ending to our saga is that we got our snorkel gear! Alex and I are both proud owners of our very own fins, masks, and snorkels! Posted in Honduras, TidBit of the DayBookmark the permalink. I think you two should use this as your Christmas card this year. It’s too cute. Glad you made it through the lines. Can you imagine the impatience most Americans would display at that kind of regular hassle? Would road rage translate into line livid? Loved the picture. Loved the picture but you scared Tucker, you two are a joy!!!!!! Caitlin looks cute…alex, why’d you scare the dog!?! haha …at least people wait in the lines in honduras, when I was in China the whole concept of a line was a fuzzy blur, and in the few places where there were official lines like customs in the airports the people stand so close behind you you can feel their breath on your neck and their body against their body…ehhh personal bubbles are just smaller there.